Get ready for the trip of a lifetime because Swagbucks.com has a great one planned to kick off the weekend. 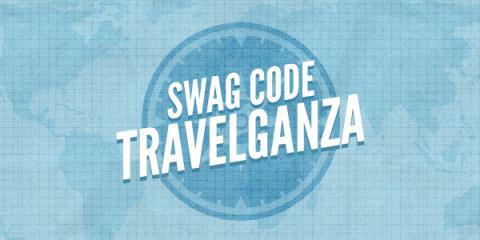 On Friday, April 4th it’s our Swag Code Travelganza! The Travelganza begins at 7am PT and will run until 6pm PT (10am ET – 9pm ET). For UK/IE/AUS, the Travelganza will begin at 7am local time. The trip will be filled with sight seeing, travel games, some entertainment and a chance to capture all of the memories forever! Make sure to check out Facebook, Twitter, Pinterest and the Swagbucks Blog for fun and games. Earn up to 20 Swag Bucks in Swag Codes alone! Swagbucks occasionally throws these big Extravaganzas to give out multiple Swag Codes a day and turns the whole day into fun, games, and much more. If you aren’t earning Swag Bucks yet for free gift cards like Amazon, PayPal, Walmart, iTunes, and more, here’s your chance to join in. It’s a great way to earn a big amount of Swag Bucks right away. That means you’ll get your first gift card sooner, so don’t hesitate — sign up here.